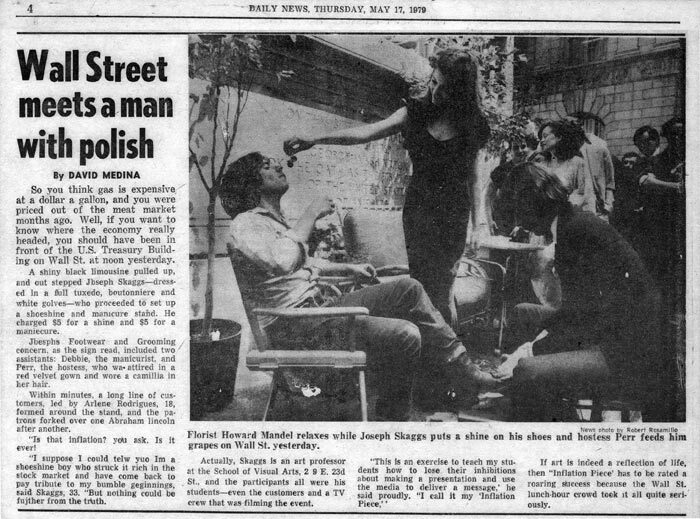 Joseph Bucks was formerly a shoeshine man on Wall Street. For years he had listened to stock brokers who stopped in for a shine. When Joseph began to invest his hard earned wages, he discovered he had a gift for picking winners. It didn’t take long for Joseph to amass a small fortune, which he quickly turned into a much larger sum. 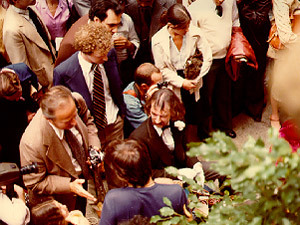 To celebrate the roots of his fortune and to say a fond farewell to the clients who had made him rich, he set up a shoeshine stand with fine furniture, lush plants, and a gold plated shoeshine kit at his favorite spot on Wall Street. 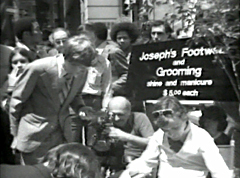 He placed a sign on an easel which read “Joseph’s Footwear and Grooming.” He had a beautiful manicurist and he charged the outrageous sum of $5.00 for the shine. Mr. Bucks (a.k.a. 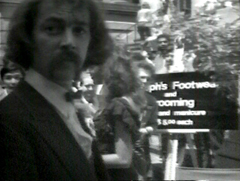 Joey Skaggs) pulled off this street theater with the help of friends and his Media Communications students at the School of Visual Arts. The piece was about inflation and conspicuous consumption. And, Skaggs’ students, by actively participating in the satire, learned first-hand how to access the media to deliver a message. Working as shills, they paid $5.00 for a shine and told the reporters they thought it was a really good deal. Many hoped they could get a tip or two from Bucks himself. Soon other people in the crowd wanted to have their shoes shined too. All the real customers, although they didn’t know it, were performing for the press. This was not the last time that SVA students would work with Skaggs to hoax the news media. He taught there for years and frequently engaged his students to work on projects. Actually, in 1994, the school created a class specifically for him, called Culture Jamming and Media Activism. It was the first of its kind in an art school, anywhere.